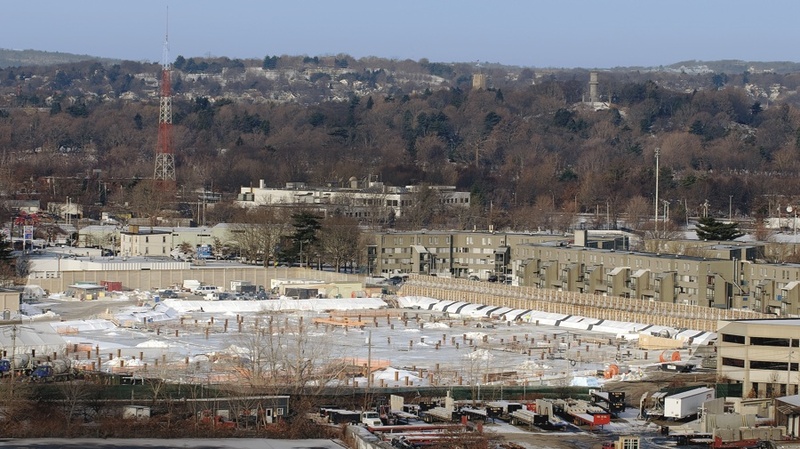 Construction of the Allston science complex will halt. The Charlesview housing site, across Western Avenue (to the right), will come under Harvard’s control—but development of a proposed arts and cultural hub at this key intersection with North Harvard Street remains a vision for the future. Bowing to financial reality, the University announced in December that, as expected, it will halt construction on its huge science facility in Allston—the first part of an ambitiously envisioned campus expansion during the next half-century. Moreover, Harvard is in effect rebooting its planning effort for that expansion overall. That implies a longer deferral of Allston development—and raises the prospect of significant changes from the prior vision of new homes for the Harvard School of Public Health (HSPH) and Harvard Graduate School of Education (HGSE), a cultural and performing-arts complex, expansive laboratories, new undergraduate residences, relocated athletic buildings, and other facilities. Formal notification came in a letter from President Drew Faust. Addressing the science facility first, she wrote that the University “will pause construction” after completing current work in early spring. The letter gave no projected duration for the “pause,” and introduced a new wrinkle: continued analysis of “strategies for resumed activity, including co-development.” This suggests that Harvard is exploring options for a partnership with private investor-developers, local hospitals, other institutional users of laboratory space, or pharmaceutical companies (which have made large investments in research facilities in Cambridge and the Longwood Medical Area in the recent years). These options are more conservative than those announced in February 2009, when Faust made public the decision to review construction on the project (estimated to cost $1.3 billion to $1.4 billion). Faust said then that the facility’s foundation would be brought up to surface level—representing perhaps 30 percent of the construction cost—but that purchases of materials needed to build the four laboratories themselves would be deferred while Harvard undertook a thorough review of the project’s scope and pace. The options, she said, included proceeding as originally planned (if economic conditions improved rapidly); reconfiguring the building “in ways that yield either new cost savings or new space realization”; and pausing construction completely. The first option is obviously moot. The second—redesigning the facility—is now contingent on the needs of a possible co-developer. Given the tens of millions of dollars (and possibly more) needed to refit existing laboratories for the scientists diverted from Allston, and to relocate other professors to accommodate these moves, it is unlikely the University would want to incur those large costs again, soon, simply to gather stem-cell, bioengineering, and systems-biology staffs in Allston. Overhead funds paid with sponsored-research grants are an important means of defraying capital costs for laboratory buildings and facilities. With scientists diverted from Allston, and growth in their ranks slowed, the population of investigators whose grants would help pay the indirect laboratory costs will be smaller, making it harder to cover additional debt costs that Harvard would have to incur to erect the new Allston facilities. (See “Further Financial Fallout ,” January-February, page 45, for information on the faculty retirement-incentive offers and the plan to reduce new professorial appointments, at least within the Faculty of Arts and Sciences.) Faust’s letter said that “Harvard’s significant momentum in the life sciences” will “in no way” be slowed by the delay in the Allston science complex, and that faculty recruiting will continue. But the trajectory has clearly changed. According to a News Office interview with executive vice president Katie Lapp, who oversees Allston, “We expect to take the next year to look at possible opportunities, including co-development with private partners or other institutional partners that may make sense for that site, as well as for other Allston sites that Harvard owns.” The last phrase points to the larger Allston program. In effect, this means that translating Harvard’s broad Allston vision into actual zoning and approvals under Boston’s regulatory review process will take more time, and will likely involve change—perhaps significant—from the internal work done so far. Harvard’s planners and consultants have developed an outline for new roads, infrastructure, green spaces, and broad quadrants (academic buildings, laboratories, cultural facilities, and so on) for use of its landholdings in Allston. As guidelines, those appear to be intact. But apart from the now-suspended science complex, none of the outlined objectives exist in the form of committed users of the space, nor concrete proposals for architectural design or ensuing development. Of note, that team—reporting through the executive vice president—will coordinate the work of Faust, the provost, and the deans “to understand the priorities of the University and the schools over the next decade and will recommend ways in which the University’s growth needs can best be addressed, structurally as well as financially.” That time horizon—the next 10 years—suggests a foreshortening of planning, but also, perhaps, a more realistic grasp of what can actually be achieved. But its suggestion that priorities need to be reassessed and ranked means that Allston development is only a piece of the puzzle. When the public-health school was identified as a candidate for relocating to Allston, for instance, the cost of the alternative—updating its Longwood facilities—was estimated to exceed a half-billion dollars. Harvard planners are now evidently going to revisit every school’s facility needs, how these could be met, and where. Development in Allston, where costly infrastructure would have to be created in advance of much academic building, becomes one among contending priorities. As Lapp said in the interview, “Allston planning going forward will be fully integrated into University planning, keeping in mind not only our programmatic needs, but our holdings in Longwood, Allston, and Cambridge. This is an opportunity for us to think about our campus in holistic and strategic ways.” Among those priorities is renovation of the undergraduate residential Houses, a billion-dollar-plus program for which funding has not been arranged yet. One parcel critical for future concentrated campus development is closer to Harvard control. Just before Christmas, Boston authorities approved a plan to replace the Charlesview housing project, at the corner of North Harvard Street and Western Avenue, with new units at a University-owned parcel farther down Western Avenue. Harvard’s prospective purchase of the existing site will help defray the costs of building the new housing, while securing a key site at the center of the Allston campus expansion—when and as it occurs. These decisions may not have surprised the Allston community, but they did pose new challenges. Residents have participated in hundreds of hours of meetings with Harvard and Boston officials in the past several years, as plans have been drafted and revised. Faust’s letter addressed “property stewardship and community engagement” and “campus planning and greening.” For the former, she wrote, Harvard will make more of the buildings it owns available for re-leasing, to bring life back to local streets. Rentals proceeded slowly when Harvard offered short lease terms (one to five years); it will now offer 10-year leases on up to 100,000 square feet of space—an indication, of course, that their use for Harvard-related redevelopment is now much longer off in the future. “Greening” involves landscaping, tree planting, and completion of a park behind the Allston public library branch. In mid January, as an amenity, Harvard erected an indoor skating rink on Western Avenue for free community use through the end of March. Whatever disappointments the December announcement may cause, it reflects new circumstances. Private or non-University institutional investment may advance some uses of Harvard’s landholdings in Allston faster than the University can now afford to do on its own.